Each season, we choose the themes for our collections with meticulous care to ensure that they align with our values, with our deep respect for nature and for the venerable Vietnamese craft traditions that we represent. You can find our newest collections at our boutiques. In our modern industrial world, to capture the ephemeral beauty of nature in our crafts and bringing it into our homes becomes a true act of salvation. Whether it’s in the curve in the stem of a wildflower, a soft meadow breeze, or the intricate patterns on a dragonfly wing, the enchanting artistry of nature is the great kind of beauty which, if we could have cocoon us in our beloved homes, can become an eloquent source of comfort in the spaces in which we are most truly ourselves. This way, coming home each time becomes an act of returning to an oasis of beauty and spiritual repose. In this endeavour, we at Authentique have turned to one of the most darling and familiar displays of natural beauty in the Vietnamese landscape: the bougainvillea. The bougainvillea is often seen bountifully adorning the town houses and courtyard gardens of all kinds of Vietnamese families, from rural countrysides to upperclass neighbourhoods. Displayed in a bright variety of colours, this light-hearted flower is composed of delicate, textured petals, the softness of which has given it the name hoa giấy, or paper blossoms, in Vietnamese. 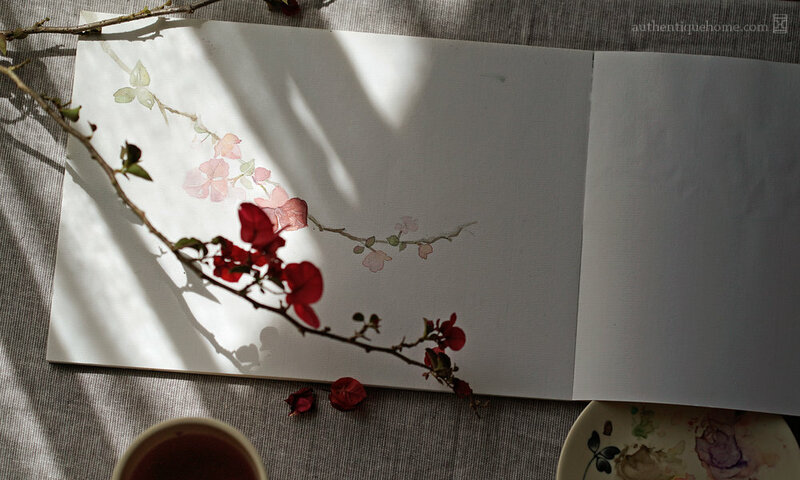 It is this ephemeral softness that inspires us so, and that we seek to lastingly capture in the elegant ceramics and textiles that make up our homes. Working at the balcony on a beautiful morning and with a gentle cup of tea, our in-house artist immerses herself in her own world, meticulously observing the ephemeral details of her subject. Painting the first draft is the most challenging yet rewarding process, one that calls for the utmost sensitivity and sophistication. It is not merely the surface looks of the bougainvillea that need heeding. All its stunning natural details, from the way it sprouts to the way it swings in the wind, all need to be considered, and judicious decisions have to be made on which details to represent in the art. Once this inspiring process is finished, the painting is to be reproduced in ceramic and textile form, a process that is many times more demanding. In textile work, the choice of fabrics, colours, and techniques all influence the final product in meaningful ways, and are chosen based on the way they best and most beautifully represent the bougainvillea and all of its endearing characteristics. In this endeavour, our textile artisans have turned to drawing directly onto the fabric in order to depict the fragility of the petals, which is a great and very different challenge to drawing on paper. Similarly, the application of the art onto ceramics presents its own unique challenges. The colour gradient, expressed gently by the hands with brush and ink, needs to express the natural creases of such delicate flowers. Consequently, the individuality of each petal, each flower and leaf, is distinguished and enhanced. Only through paying mindful attention to the bougainvillea can the artisan recognise its unique details that seperate it from other species of flowers. In a modern information age where we are conditioned to skim through our perceptions and compress them for least information usage, we all too often fail to grasp the sophistication and beauty of our environment, therefore to truly perceive it in a meaningful way. When we instead pay close attention to other natural beings, we see how subtly complex they are — and how subtly beautiful our world is. Despite the demanding nature of the work, all the artists involved are able to put their all into what they do, so that the ceramics and textile products are crafted not only by hand, but also by the heart and spirit. In this way, it is our hope that, for how much love we give a piece in its making, it shall once again receive in equal amount of love and respect from those who use and collect it. When presented in our homes, beyond the elegant beauty and comfort that they provide, they are also a gentle reminder in our fast-paced industrial world to live more slowly so as to appreciate the little details of pure and natural beauty that surround us in our everyday lives. We hope you will bring some home so you may be reminded daily of the joy of being — the joy of feeling connected to our beautiful planet through our subtle and simple yet gracefully sophisticated surroundings. Similarly, the application of the art onto ceramics presents its own unique challenges. The colour gradient, expressed gently by the hands with brush and ink, needs to express the natural creases of such delicate flowers. Consequently, the individuality of each petal, each flower and leaf, is distinguished and enhanced. Only through paying mindful attention to the bougainvillea can the artisan recognise its unique details that separate it from other species of flowers. In a modern information age where we are conditioned to skim through our perceptions and compress them for least information usage, we all too often fail to grasp the sophistication and beauty of our environment, therefore to truly perceive it in a meaningful way. When we instead pay close attention to other natural beings, we see how subtly complex they are — and how subtly beautiful our world is. 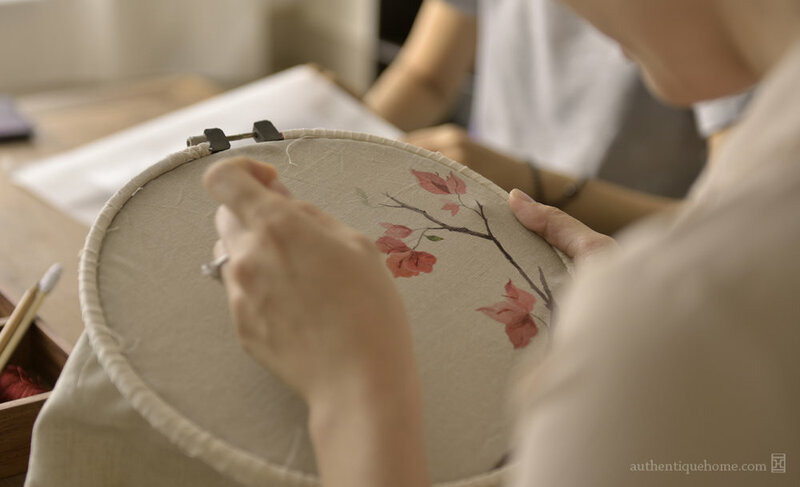 Despite the demanding nature of the work, all the artists involved are able to put their all into what they do, so that the ceramics and textile products are crafted not only by hand, but also by the heart and spirit. In this way, it is our hope that, for how much love we give a piece in its making, it shall once again receive in equal amount of love and respect from those who use and collect it. When presented in our homes, beyond the elegant beauty and comfort that they provide, they are also a gentle reminder in our fast-paced industrial world to live more slowly so as to appreciate the little details of pure and natural beauty that surround us in our everyday lives. We hope you will bring some home so you may be reminded daily of the joy of being — the joy of feeling connected to our beautiful planet through our subtle and simple yet gracefully sophisticated surroundings.